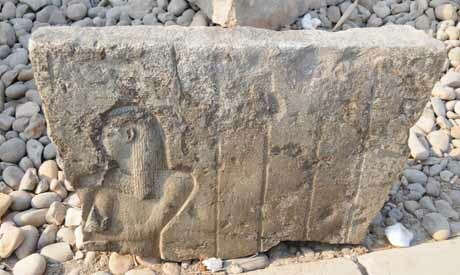 Minister of Antiquities Mamdouh Eldamaty told Ahram Online that the mission also uncovered small limestone blocks of a number of columns and the ceiling of the temple of 30th Dynasty King Nakhtanebu I. The ceiling is decorated with stars. Parts of Kings Meneptah and Nakhtanebu I statues were also found along with a collection of mud bricks used in the fence that once surrounded Oun. 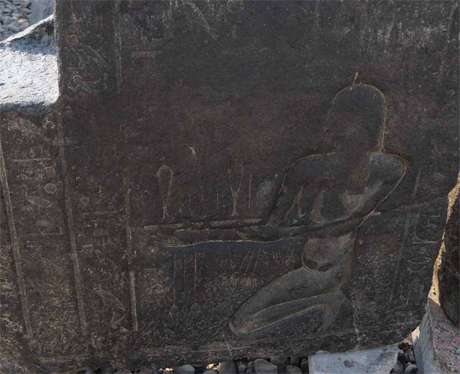 Mahmoud Afifi, head of the Ancient Egypt Department at the antiquities ministry, explained that the sizes of the newly discovered blocks of the shrine range between 75cm and 1.25 cm, carved in Basalt and engraved with the different names of Egypt’s regions at that time. Other blocks are decorated with scenes depicting the god Hapi holding offerings. Further excavation is now in full swing in an attempt to unearth more of the shrine’s blocks, in order to restore it to its original form. 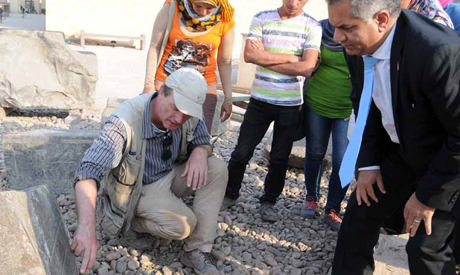 Oun is one of the oldest cities of ancient Egypt, the capital of the 13th Lower Egyptian nome. Today, it is mostly destroyed, its temples and other buildings used for the construction of medieval Cairo.